After having my chiropractor work on me me using the Emotion Code method over a number of appointments I realized that he often found an emotion at a particular age that made perfect sense. Maybe it was just a coincidence. But then… maybe not. At this point my left brain was taking a beating. I was experiencing things my intellectual, overly rational self was having a hard time reconciling. I had heard and read by this time that there are NO coincidences in life and I was open to putting this theory to test. So I went with the “maybe not” answer. I decided to buy the book and delve further into this technique for myself. I knew from my personal and family background that I had a lot of emotional baggage. Each time my doctor did the Emotion Code with me I felt like I’d have to see him every day the rest of my life to unload all my crap. Which led me to ask, could I do this myself? It was now summertime of 2009 and an out of town friend was over for dinner. As conversations go one thing led to another as we talked about a lot of topics. Suddenly, out of the blue, she mentioned a book she was reading, The Emotion Code. I about fell out of my chair. I said, “I can’t believe you said that. I’m reading that book right now. It’s on my bedside table.” Coincidence! This time I couldn’t answer yes. I ran and got the book and we started to have a lively discussion about it. She said she had been practicing it on herself for a number of months and had even practiced on a few animals. My friend went through the simple Emotion Code procedure and discovered a few trapped emotions which she released. We ended the evening with a we’ll see attitude but to be honest I didn’t really see any change in Daisy’s behavior. Dang! I was really hoping to see the proof I needed. I’m not a quitter and don’t give up so easily so I was still open for another opportunity. A number of days later we were walking Daisy and her 5 year old son Boomer, on the river walk trail. Daisy loved the water and there was this bend in the river where it made a great swimming hole. 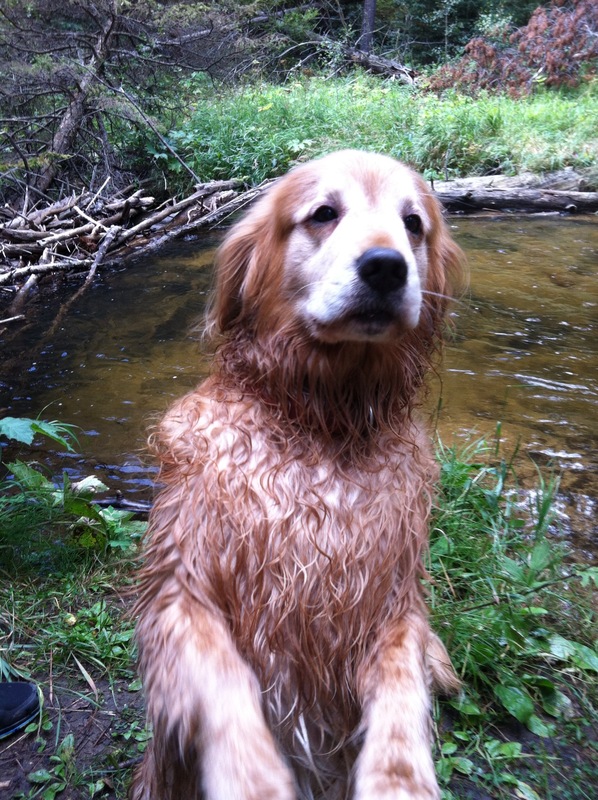 The water was the perfect depth for swimming and Daisy loved to fetch treats we’d throw in the calm current. Boomer, on the other hand was petrified of the water. We could get him into the river to just about his knees. If I went in first and gently pulled him in, even in water where he could touch he got extremely nervous. And if I tried to get him to where he couldn’t stand and where he would have to doggy paddle he literally panicked and thrashed about. We thought it odd that even watching his mother was not enough to persuade him to join in on the fun. His fears were just too strong. Right then I had an ah ah. Maybe Boomer had trapped negative emotions that were causing his fear. Later that day I did the Emotion Code on him and released a few emotions. I did it just to say I tried. Not really thinking much would come of it, I don’t even remember the emotions I released. Well, the next time we went to the river walk with the dogs I had completely forgotten that I had done the Emotion Code. I noticed that Boomer was in just a bit farther than he had ever gone by himself. I went in the water and called to him. He seemed actually willing, even excited. So I gently grabbed him with both arms and held him as we went a little deeper. And lo and behold he wasn’t fighting me. He was still a bit nervous so I didn’t push it but he actually let me take him out to water where he had to doggy paddle with me by his side! Wholly molly Batman! At that very moment my Golden Retriever told me that this Emotion Code stuff is for real. I got out of the river. Looked at my husband and said, “Well, will you look at that?” From that day forward Boomer got more and more confident in the water and began swimming with his mom. Whenever my doubts creep in as to whether this stuff works or not I just think back to that moment. Oh, and by the way. I kept working with Daisy on her licking problem. It took a number of months but she stopped her nervous habit and she was able to live the rest of her life booty free.